Mount Kilimanjaro Final Blog - Chartwell Group David Snell of the Chartwell Group provides high technology consulting in the areas of operations management, sales and marketing strategic and tactical planning, business development management and investments. I have been back from Africa for just over one month and I still lack the words to describe my Kili adventure. I called it my “Journey to Remember” before I left but I realize now that I underestimated the ever lasting footprints that this would have on my heart. The first thing that comes to mind is my team. I could not have hand picked a more wonderful group of people for this journey. Jordan & Lindsay… thank you for letting us tag along on your honeymoon. Jennifer… I will never forget how our dinner conversations somehow became normal to you. Brenda… your bounce back on the mountain was amazing. Jane, Salim & Aly… your dedication to your family and to those suffering with the disease is inspiring. Dr. Susan… thank you for not giving us shots! Rowena A. before the climb with the "Friendship Stick"
The second thing that comes to mind is ascent night. Waking up at 11pm… heading out at midnight. The final push up the mountain was honestly about one hundred times more challenging than I gave it credit. My body held up physically but overriding my impulse to turn around and go back down took everything that I had. “Mambo, dada?” I would hear from my guide in the darkness. His face showed compassion and concern as he asked me “How are you, sister?”. I replied (in Swahili), “I am tired, brother” and then took another step. I still don’t know how I managed to take each step that I needed to on the way to the top but I have a feeling that I was “helped” by a lot of people cheering me on back home. Each “good luck” echoed in my mind and each person who had been touched by the disease flashed before my eyes. I didn’t climb the mountain for myself… I climbed it for all of them… for all of you. Was it the hardest thing that I have ever done? Yes, without a doubt. But it was also the most rewarding. I challenged myself to a level that was beyond anything that I have ever done before. I battled through the tears and came out the other side… in one piece. Thank you to everyone who supported our teams. We did feel you there on the mountain with us! I look forward to meeting the 2010 Ascent for Alzheimer’s team in a few weeks and a little part of me can’t help but be jealous and wish that we were doing it all over again. This is one of my favourite pictures. 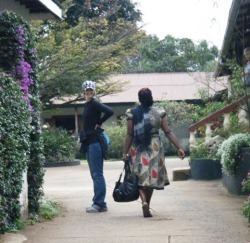 My team mate Lindsay casually greets one of the staff at the Marangu Hotel. 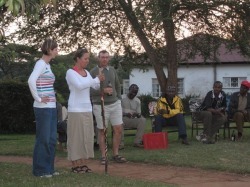 Each team brings a “Friendship Stick” up the mountain. Our team decided to present the stick to the Devji family, in recognition of a lifetime dedicated to help those with Alzheimer’s disease and their remarkable adventure as a family in climbing Kili together. 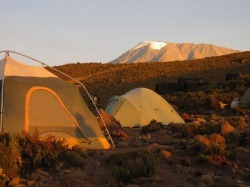 Horombo Hut is the last camp before leaving Kilimanjaro National Park. Kili looms in the background as a constant reminder of where we have been, mere hours before.